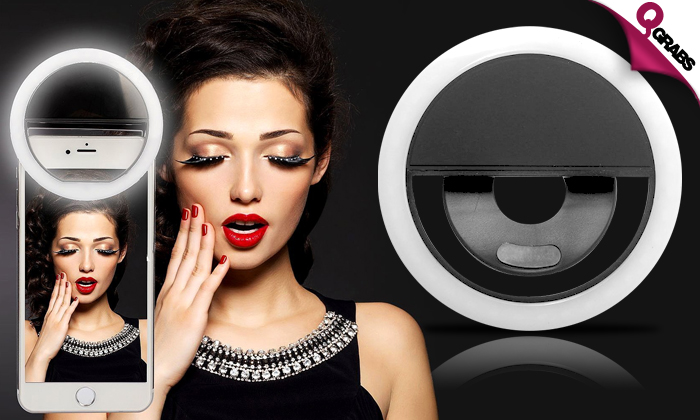 Clip-on Rechargeable Selfie Ring Light! Items not collected/received by 21 April 2019 will be forfeited and no refund will be given. Take perfect photos with this selfie light using the front camera on your smartphone, mobile phone or tablet. The selfie light is simply fastened with the integrated clip on the mobile phone or tablet. It remains firmly fixed to your device even when you’re moving, e.g. when filming. The 3 brightness levels of the 36 LEDs always provide the right light levels. This selfie light will make your next YouTube video, Instagram snapshot or video phone call a success, even if light conditions are bad. Alternatively, you can plug the light on to your phone and use it to boost the phone’s integrated flash. You can charge the battery conveniently using the charging cable (included). Perfect pictures and videos with up to 50% off!